Minimalism at it's finest. I've been craving basics lately and this Popbasic tee has been my go-to. Not really sure how I've lasted over 20 years without having a basic tee like this in my wardrobe, but now I know what I've been missing! Threw on a pair of destroyed shorts from Gap, and a pair of my favorite black, but not your average heel from Vince, and my summer hat and I was good to go! 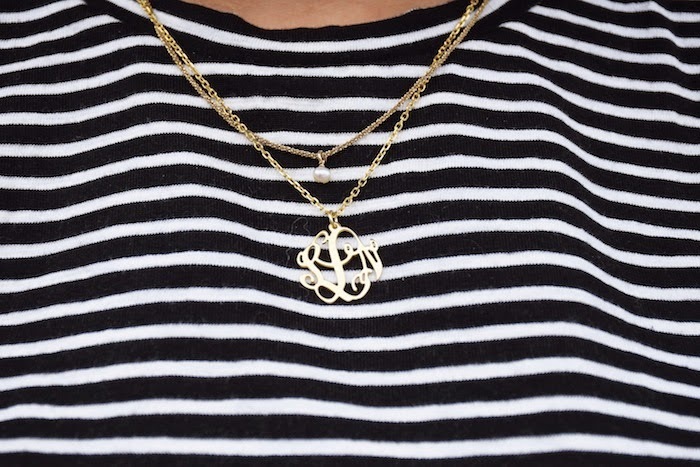 Also, OBSESSED with my monogram necklace. It's printed in the most beautiful script ever, and is so classic yet personalized, I doubt it would ever go out of style. 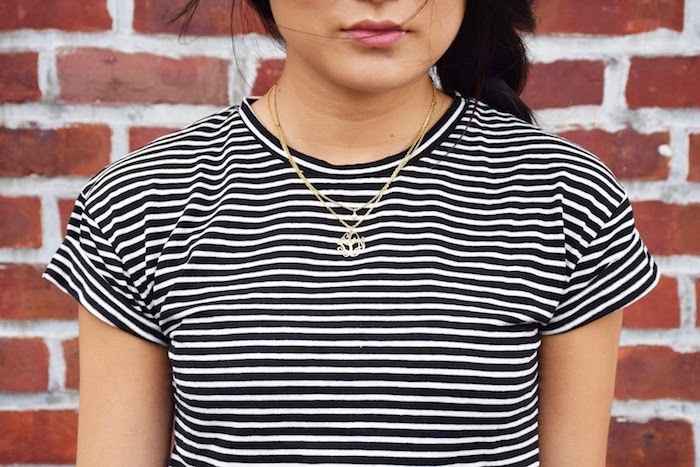 I've been layering my necklace over and over with different dainty necklaces and couldn't believe how versatile it was! I ended up ordering the necklace in the 0.8" size, which is their smallest size, since I thought that the 1.25" they usually make is a bit too big for me, and can't tell you guys how amazing the experience has been. They are so good with helping you customize your necklace the way you want it; easy and seamless--so check them out--they make many different necklace designs--use code ASKR10 to get 10% off your purchase, or get 30% off one item every Friday during their special weekend sales! Beautiful job! I just love these sandals and you styled them perfectly with your hat. Such a flattering look on you! So cute and simple -- that is my go to! Denim & stripes for the win! You seriously have the prettiest heel collection ugh I'm so jealous! Already said this on Instagram, but I always love a good striped tee! It matches so many different outfits. I love how you matched this casual look! I love this classic look <3 the shoes give it an extra kick. Love!